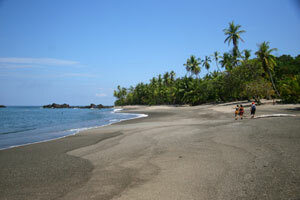 Experience Guaria de Osa where towering stands of primary Rainforest kiss the sparkling Pacific Ocean! Guaria de Osa is named after the beautiful purple Orchid, a symbol of the freshness of nature and the renewal of spirit. This is what we aspire to share and our intentions are to assist visiting guests in accomplishing just this! 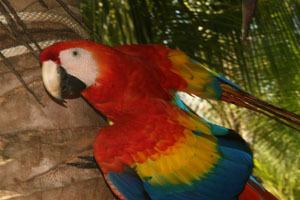 Guaria de Osa shares a remote one and a quarter mile-long coconut laden paradise beach, called Playa Rincón de San Josecito (Saint Joseph's Corner), home to Costa Ricas must abundant Scarlet Macaw population. Within walking distance of Corcovado National Park, and just south of Drake Bay on the westernmost cove of the Osa Peninsula, Guaria is embedded in a biological treasure trove a true terrestrial emerald. Within a private and secluded ethnobotanical garden, abundant with palms of many kinds, exuberant ornamentals, medicinal plants and fruit trees, our lodges are a strolls pace from the sparkling Pacific Ocean - a gigantic marine ecosystem and protected nautical zone - a sea temple and fish heaven! There are no roads here and access is primarily by a one and a half hour motorboat ride from the river town of Sierpe or twenty minutes by boat from Drake Bay's Airport. 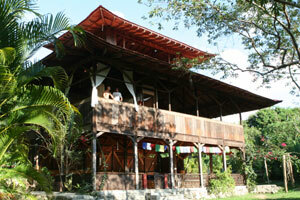 Guaria de Osa is a place for people who adore Nature and wish to bask in its splendor. 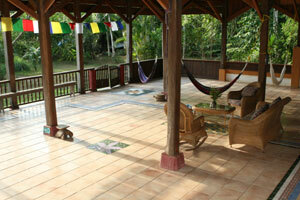 It is also a place for cultural discovery and where natural healing and renewal can take place. Our multistoried traditional lodge with breathtaking views of the Pacific Ocean offers glimpses into ancient traditions. The various healing modalities we offer alongside the vibrant bird life that fills the air with song and the clean fresh ocean breezes, all harmoniously intertwine to effectively create an unforgettable and timeless place. Our interdisciplinary approach to nature discovery with specialized staff and guides, we lead unique rainforest and oceanic tours as well as all inclusive retreats and seminars, rejuvenates and enriches participants long after returning home. With lots of stories to tell and a whole lot to share, alongside everything else that is original and unique, Guaria de Osa one of a kind, In a peaceful and warm country that will leave every cell in your body singing Pura Vida  Pure life! By visiting Guaria de Osa you are directly supporting Rainforest Conservation Projects in remote rainforest regions of Central and South America. Percentages of all funds generated are channeled to Osanimi's ground level efforts.